ACTion is absolutely delighted to have won permission to stage best-selling children’s author Dame Jacqueline Wilson’s tale of plucky Foundling-child, ‘Hetty Feather’ – brought thrillingly to life on stage by award-winning script writer, Emma Reeves! ROLL UP, ROLL UP and join Hetty on her escape from the Foundling Hospital… THRILL as she discovers Tanglefield’s Travelling Circus. QUAKE as she braves the scary streets of Victorian London. And CHEER as she overcomes all in the search to find her real mother and a true family of her own! 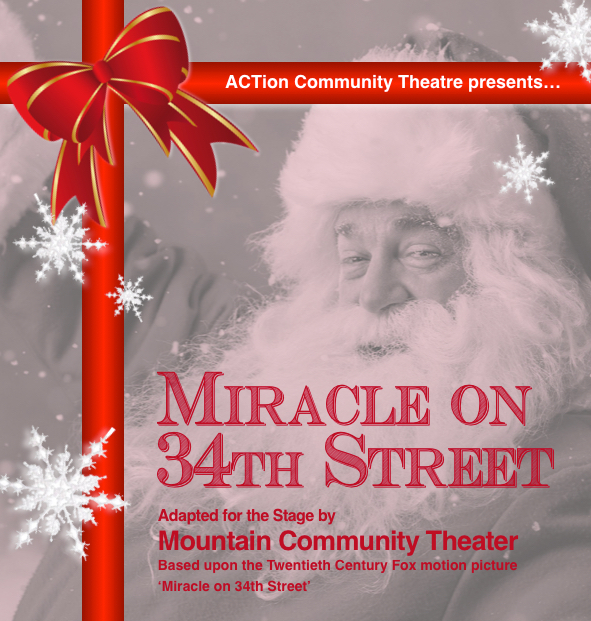 ACTion Community Theatre is super-delighted to announce that we have secured the amateur rights to stage ‘Miracle on 34th Street’ for our December 2018 Christmas production! Click Rehearsal Music Files for the One Drive link to rehearsal music files and sheet music. Click here for the Miracle Rehearsal Schedule. Thank you everyone who came along to the auditions for ‘James and the Giant Peach’ today. Having selected a small cast show, due to a falling-off in members’ availability, we’ve had 31 auditionees, including several new members interested in joining us! Ray Allen and Mike Gallimore thank you for your kind support and advice with casting. Mr & Mrs Trotter / Rhinoceros / Seagulls / Sharks / Octopus / Fish & Jellyfish and various sized Peaches! To be announced once I have spoken with people, as some of you definitely didn’t want to do puppetry. If you are interested in the puppetry – which is going to be key to the story – please message me privately.